Most people want a smile that sparkles – so it can be disappointing when you find that, no matter how hard you brush, you just don’t get the shade of white you want. There are many reasons why your teeth may have dull, yellow or dark grey stains. Common causes are regularly using antibiotics, drinking coffee, soft drinks and red wine or smoking cigarettes. If you’re someone who wants that perfectly white smile, teeth whitening is a fast and cost-effective way to remove stains and discolouration. It takes no time at all and the final result will enhance the appearance of your teeth and make them sparkle. How does in chair teeth whitening work? 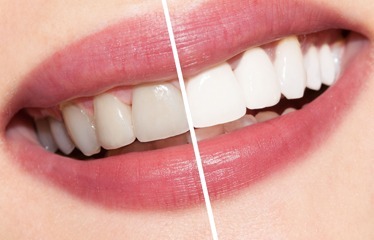 Teeth whitening is a safe and simple cosmetic dental procedure that has become highly popular over the past few years. While there are many products on the market that claim to do this from home, an in chair teeth whitening procedure is the most effective way to improve your smile. Our dental professionals have the expertise to apply the latest teeth whitening technique that will give you the chance to show off pearly white teeth. The whitening products used for this cosmetic procedure are clinically approved, safe and designed to deliver optimum whitening results. While results can vary depending on a number of factors, you can expect to leave our Rosebud clinic with teeth that are at least a few shades lighter than what you walked in with. Why put your trust in our team of friendly dentists? Along with our in chair teeth whitening procedure, the team at Peninsula Dental Care are committed to offering a full range of professional dental services. This includes dental implants, crowns and bridges, root canal treatment, veneers, wisdom teeth removal and general dentistry solutions. Whether you or someone in your family is having tooth pain – or if you’re simply in need of a check up – our Rosebud team can make sure you are given the highest quality of care. 1 hour treatment which can last up to 3 YEARS! There are many reasons why your teeth may have discolouration including the foods we eat, drinks (tea and coffee). Also some medications, aging and smoking to name a few. Peninsula Dental Care is now able to provide you with a quick and gentle procedure for Teeth Whitening, to give you that bright white smile. It works by a procedure which has been perfected over years to give you the chance to have the whitest teeth, completed by professionals to get the best and safest results. Contact us today on (03) 5981 2255 or book online peninsuladentalcare.com.au to discuss how teeth whitening can dramatically improve your smile and boost your confidence!